The People v. OJ Simpson fans hoping for another compelling retelling of a high-profile ‘90s with The Assassination of Gianni Versace weren’t disappointed, if the enthusiastic live-tweeting is to be believed. The second season of American Crime Story, Ryan Murphy’s true crime anthology series, didn’t waste any time with its Wednesday night premiere: Serial killer Andrew Cunanan (Darren Criss) shoots down the 50-year-old the Italian fashion designer Gianni Versace (Édgar Ramírez) in the first eight minutes. The rest of the “The Man Who Would Be Vogue” (written by Tom Rob Smith and directed by Murphy), shifts between the ensuing police chase and flashbacks to an encounter Cunanan had with Versace seven years prior. The episode introduces Gianni’s devoted younger sister, Donatella (Penélope Cruz), who will inherit the business, and his longtime boyfriend, Antonio D’Amico (Ricky Martin). Younger viewers may not recall the details of this infamous murder, or, indeed, that it happened at all. Here’s what the Season 2 premiere got right, and where they the writers took creative license. 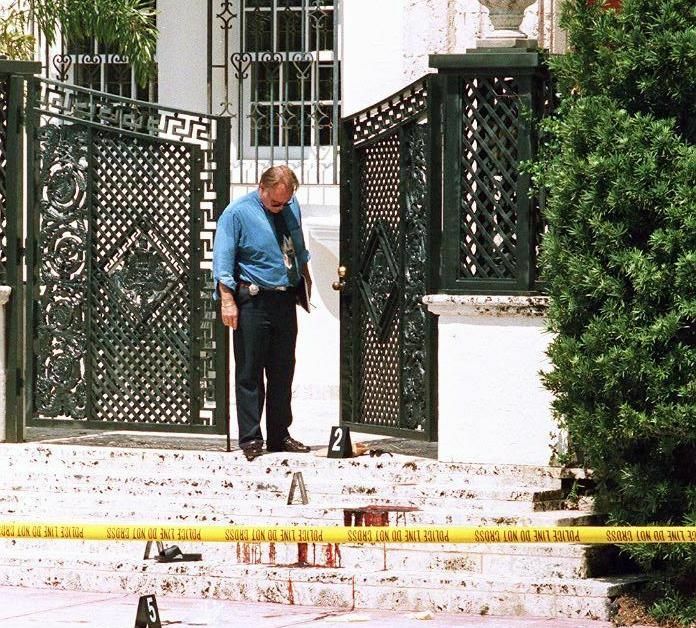 Easily the most publicized moment of the series, it’s no surprise that Versace’s murder scene is as accurate as it gets, right down to the pattern of the bloodstain on the Versace estate stairs. 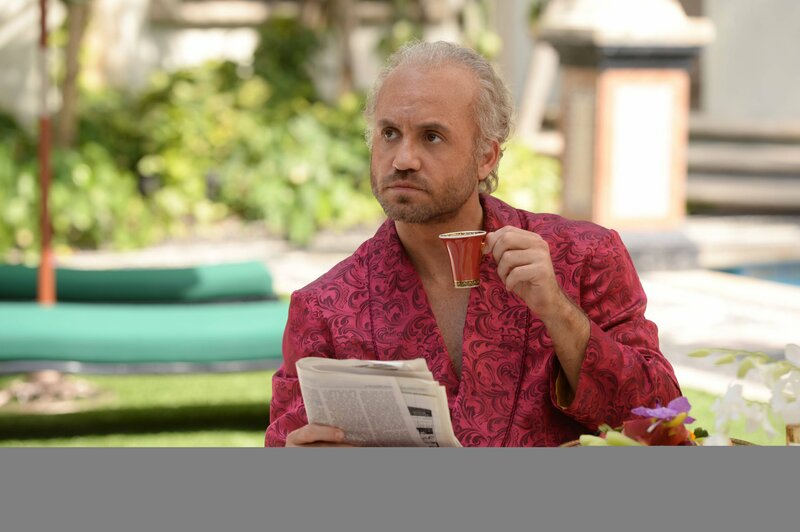 On the morning of his murder, Versace went to the News Cafe on Ocean Drive to buy a newspaper, as he does in the show. He was supposed to meet his friend, Lazaro Quintana, for tennis later. Quintana was inside the mansion with Versace's partner, D'Amico when they heard shots and ran outside. Quintana later told the press he saw Cunanan and briefly pursued him, until Cunanan pointed the gun that killed Versace at Quintana. In an interview with CBS News, Quintana demonstrated how Cunanan pointed the gun without looking at him, ensuring Quintana never saw his face. 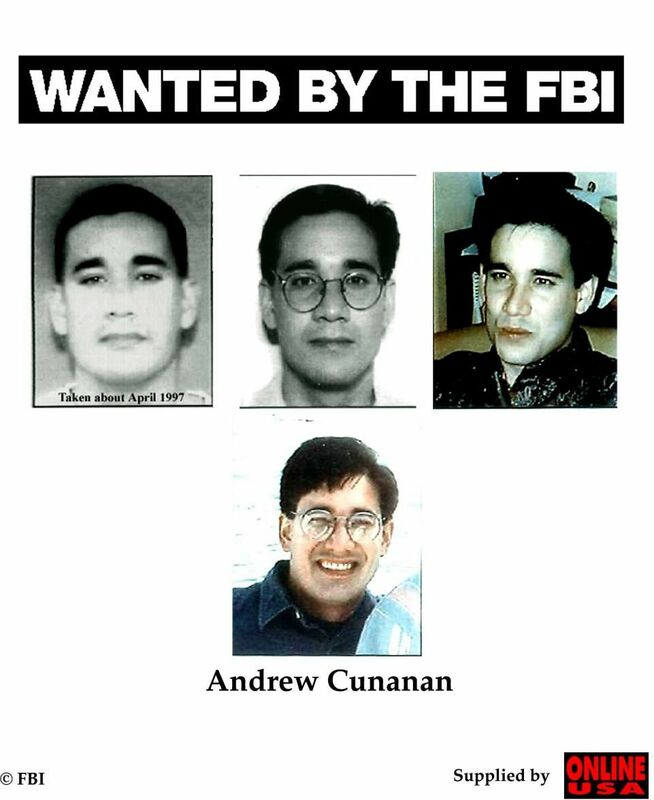 In the episode, Miami police fail to put up FBI Most Wanted posters of Cunanan after the California native is spotted in the city. (Cuanan had become an FBI suspect months earlier, after killing a real estate developer in Chicago.) This is not confirmed. However, the FBI did face scrutiny for failing to catch Cunanan, who, prior to killing Versace, had already killed four people, before spending two months hiding in plain sight in Miami. The details of how well Cunanan knew Versace are blurry, and here ACS writer Tom Rob Smith took some liberties. The series is based on 1999's Vulgar Favors, by investigative journalist Maureen Orth, who pieced Cananan’s story together through hundreds of interviews with people who knew him. His friends recalled that he often referenced the fashion designer's name. In the episode, Versace goes to San Francisco, where Cananan lived at the time, to see the opera. This is true, as was a 1990 meeting in a local nightclub. Witnesses told Orth of a conversation between Versace and Cunanan, in which Versace pointed at his future killer and said, "I know you. Lago di Como, no?" Cunanan replied, "Thank you for remembering, Signor Versace.” Versace did have a house on Lake Como in Italy, but there was no evidence that Cunanan visited the country. The line that Criss' Cunanan delivers to his friends later—"I said, ‘If you’re Gianni Versace, then I’m Coco Chanel! '"—was something he actually said, according to an old acquaintance, Eric Gruenwald, who is now a lawyer. But whether Versace actually extended an invite to Cunanan to join him at the opera, as happens in the episode, is unclear. The on-stage conversation between the two is pure speculation (and perhaps intended as a way to represent Cunanan's fertile imagination). When Vulgar Favors came out in 1999, Orth was criticized for outing Versace as HIV positive. The Versace family decried the book as a "scurrilous" attack on Gianni's legacy. In a counter-statement, Murphy and FX have defended the show’s accuracy and Orth’s reporting. Murphy did make a concession to Donatella, however: She requested that her daughter Allegra, the heir to the Versace fortune, not be included in the series. As with any biopic concerning subjects who are deceased, American Crime Story has to makes guesses. No one can know what was said behind closed doors. But one thing is sure: The Assassination of Gianni Versace's truth makes for entertaining television.